On Wednesday, July 16, Oracle released EPM version 11.1.2.2.500. It appears as if this patch is very much the same as Oracle did with the 11.1.2.3.500 patch, where multiple products are patched in one large EPM bundle patch. This PSU may be applied to all 11.1.2.2.x releases where .x is less than .500. DRM, Performance Scorecard, Disclosure Management, and Smart View are not patched in this version. HPCM – This patch introduces a new Web Service to support multi-POV calculations for Standard Profitability applications. Shared Services – You can now select and delete all taskflows listed on the Taskflows screen. Planning – Response time has improved for Hyperion Planning 11.1.2.2.500 functionality in a browser. The Hyperion Planning response time for functionality within a browser is faster in the 11.1.2.2.500 release. For example, the 11.1.2.2.500 end-to-end response times through the browser averaged 41% faster than 11.1.2.2.300, with up to 200 users on the system. Some actions, such as scrolling forms, completed 70% faster in 11.1.2.2.500. 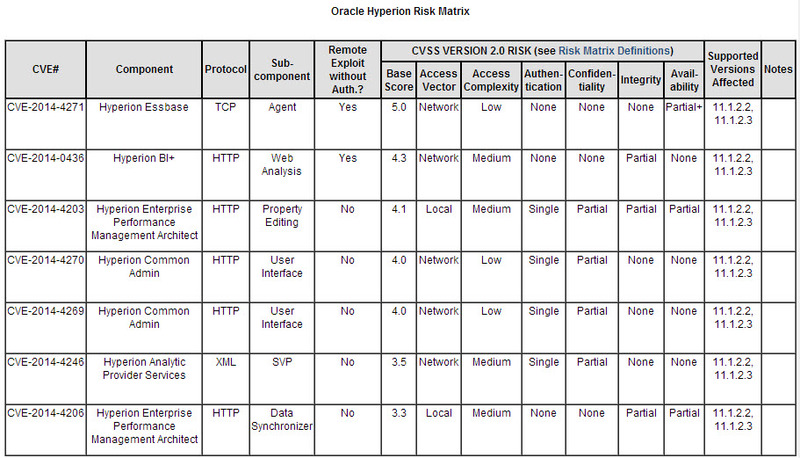 To see the full updated EPM Platform compatibility matrix, click here. If you clicked the link from the announcement to My Oracle Support note number 1666884.1, the Patch Set Update and Critical Patch Update July 2014 Availability Document, will give you the patches to fix each vulnerability. 11.1.2.2 SPU Patch 18659116 and SPU Patch 18856417 CVE-2014-0436 I could not find these patches. The links do not show the patch. 11.1.2.2 CPU Patch 18659116 CVE-2014-4269, CVE-2014-4270 I could not find this patch either. 11.1.2.2 SPU Patch 18659116 and SPU Patch 18856417 CVE-2014-4203, CVE-2014-4206 I could not find this patch either. In addition to the application patches, we also find that WebLogic Server 10.3.6.0 is listed. This is important because it is part of our installation of EPM 11.1.2.x and most of us take it for granted. Also note in the announcement that there is a patch for OBIEE’s Mobile App Designer. 11.1.1.7.0 SPU Patch 18794832 CVE-2014-4249 Must delete existing MAD deployment and install this one. Check the readme. This appears to be a replacement for the entire MAD install. Going forward, I will use the Oracle BI Mobile App Designer patch 18794832 instead of the older 17220994 patch. This patch came out on 6/3, so they aren’t very good about announcing these patches. I guess that’s why we should be reading these quarterly announcements to find out what has been fixed.